The origins of Carlo Erba go back as far as 1853, when Dr Carlo Erba founded his first chemico-pharmaceutical laboratory in Milan. From the outset the company was involved in the production of both reagents, i.e. 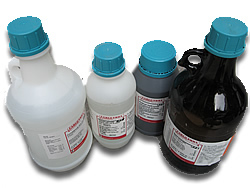 the pure chemical products needed for laboratory work, and pharmaceutical preparations. The reagents business grew fast and in 1876 there were 1,763 items int he first Carlo Erba Reagents catalogue. As the years went by the chemical sector gradually developed a specific character of its own. Today Carlo Erba Reagents still operates in the fields of pure chemicals for laboratory material and, more recently, the control of environmental pollution. Carlo Erba Reagents has its own manufacturing, quality control, marketing and research & development structures, with centres in Milan, Paris and Barcelona. Besides Carlo Erba Regents is present since longtime in many Countries through representatives or agents. Carlo Erba Reagenti is woleheartedly and consistently committed to complete Customer satisfaction. Quality and safety are the added value that Carlo Erba Reagenti offers at no extra charge with the purchase of its products. ISO 9002 Certification, recognition awarded to Carlo Erba Reagenti's two production bases (Rodano, Milan-Italy and Val de Reuille, Paris-France), ensure users that each and every operation is performed in full compliance with the regulations set forth in the Quality Manual: from the moment the order is taken to production and distribution of the finished product. The Quality System adds transparency and consistency to all corporate activities. Compliance of the Corporate Quality System with ISO 9002 regulations is periodically controlled and warranted by an outside certifying agency, accredited by national bodies recognized at a European level. Control measures, in-house inspections and inspections by the outside certifying agency result in continuous improvement of total quality and are translated into the reduction of costs by eliminating "sub-standard" products.